Playgrounds—where the imagination has no limits. No Fault embraces this concept with countless application options of its No Fault Safety Surface. Widely regarded as the poured-in-place industry standard, No Fault has been the innovator within the safety surface industry for three decades. The company's goals of dedication to service, quality and commitment to safety, in addition to ingenuity, set No Fault apart from other companies. The unconventional playground pictured serves as a creative play area, and clearly demonstrates how this facility stands apart from others with its emphasis on safety and originality, as only No Fault Safety Surface can. IMC is a manufacturer of loose-fill rubber playground surfacing. IMC has various rubber products and colors to fit your needs for surfacing and your budget. Its two main lines, Rubberific Mulch and NuPlay, are ADA-compliant with head-impact ratings that are second to none. Rubberific Mulch is a tire buffing, which is shaped to resemble the shaved look of wood mulch. NuPlay is a rubber nugget material capable of taking a fall of up to 13 feet, with a depth of only 6 inches. IMC's nationwide distribution network allows it to deliver products in a timely manner. Dinoflex has manufactured rubber playground surfacing tiles since 1989. Its primary commitment in the development of products for playground surfacing is to provide superior solutions for impact absorption. High-quality standards, coupled with consistency in production, yield some of the finest-quality tile on the market today. Dinoflex Playground Surfacing Tiles are made from 100-percent-recycled tire rubber (black) and new EPDM rubber granules (to add color). Dinoflex's unique, self-aligning interlocking system creates an easy and accurate installation with minimal maintenance. They turn playgrounds into accessible play areas that promote learning, creativity, interactive play and, above all, fun. Surface America is an industry leader with a complete line of playground and sports surfacing systems. 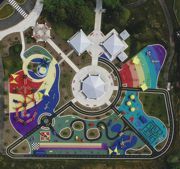 Surface America's PlayBoundTM Poured-in-Place systems transform traditional playground areas into state-of-the-art recreational surfaces—providing a greater level of shock absorption to protect children as they play. Unlike traditional loose materials that shift as children play, poured-in-place stays put, providing consistent and reliable safety. Poured-in-place surfacing systems are easily customized to meet the safety, design and aesthetic requirements of any playground. Each PlayBound Poured-in-Place system is IPEMA-certified and comes with Surface America's industry-leading warranty. Perma-Turf® is a unique safety product that cushions falls and provides a soft, resilient surface for landing. When installed at a 6-inch depth and maintained under CPSC guidelines and product specifications, Perma-Turf® has properties no other surface can offer. Made of fiber-reinforced rubber particles, Perma-Turf® creates thousands of air pockets that absorb the shock of a fall. Perma-Turf reacts with a resilience, bounce and spring that will minimize the impact of a fall and decrease the possibility of a serious or life-threatening injury. Environmentally safe, non-toxic, non-abrasive, does not decompose, easy to maintain. The latest introduction to the RecBase® line of recreational surfaces, Zeager's new RecGrass® playground surface is a natural-looking and soft synthetic grass that provides a very low-maintenance and reasonably priced safety surface for play areas. Like all of Zeager's playground surfaces, RecGrass® is third-party-certified and meets ADA, ASTM, CPSC and CSA requirements for playground surfaces. Children love the green grass look and cool feel all year long. No puddles or messy infill materials on this grass, because the RecBase® underneath provides excellent drainage and fall protection. RB Bounce Back Tiles meet ASTM F1292 and all safety standards for fall zones up to 10 feet high. You'll have less worries, and fewer injuries reduce liability and lower premiums. RB Bounce Back Tiles are virtually maintenance-free. There is no daily maintenance required to maintain safety standards. This lower-cost, lower-hassle safety surface system is easy to install, with a simple and economical installation over concrete or asphalt. RB Bounce Back Tiles are available in a multitude of colors. EnvyLawn® is designed for maximum durability, safety and appeal. These attributes are a great combination for a playground safety surface and EnvyLawn provides the best quality and most natural-looking surface on the market. EnvyLawn is ideal for playgrounds, daycare centers and playing fields of any size or style, and can be installed to meet fall heights up to 12 feet. EnvyLawn drains better than poured-in-place or rubber tile, and provides a unitary surface that stays soft and resilient. Access to a natural-looking safety surfacing has never been easier with dealers across the country.